Secure print release requires end-users to enter a password or present a device for authentication of identity data before a printer releases a job, to protect privacy or to meet compliance mandates. Every organization seeks to make existing business processes more efficient and ultimately reduce costs. 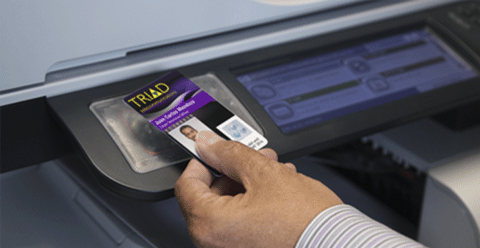 Secure print release applications with Genuine HID Technology™ allow you to take full advantage of employees’ physical access control badges by extending them to be used for securely printing documents. This minimizes your capital investment and helps control costs, while reducing your carbon footprint at the same time. Developed through our partnerships with leading printer manufacturers and software providers, Our partners’ secure print release solutions are designed to seamlessly integrate into your existing HID Global physical access control infrastructure. Reduce the amount of paper, toner and electricity used; print documents only when an authorized employee has presented their Genuine HID credential to a printer. Provide an additional layer of data protection and facilitate and industry-specific compliance requirements such as HIPAA, Sarbanes-Oxley and PCI. Enhance the value of your security investment with interoperable Genuine HID Technology. HID Professional Services offers highly specialized expertise and technical knowledge to help ensure the successful end-to-end implementation of a secure print release system. Make access control do more than open a door. Communicate with iCLASS SE® enabled smart cards and mobile devices.